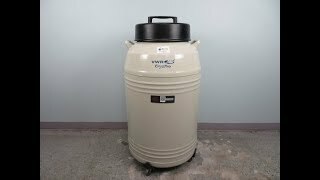 The VWR CryoPro Cryogenic Storage System offers you medium capacity storage in a compact, cost effective design. This Cryogenic Storage System features an advanced vacuum insulation system and a narrow neck, built to minimize liquid nitrogen loss while maintaining excellent uniformity, holding at -185°C even with a liquid level of 2”. This liquid nitrogen storage container holds up to 5000 samples, in an indexed rack and box system that allows for quick identifications and retrieval of samples. The CryoPro was designed for a capacity of 121 liters with an average daily consumption of 0.99 liters. This VWR CryoPro Cryogenic Storage System has been leaked tested and passed without issue. All of our lab equipment comes backed with our standard warranty. Should you have any questions, please don't hesitate to contact us.